Yamaha Motor Receives Global Red Dot Award, European-market Sports Model MT-09 - News Releases | Yamaha Motor Co., Ltd.
IWATA, March 24, 2014– Yamaha Motor Co., Ltd. (Tokyo: 7272) announced today that its sports model, the MT-09, has received the world renowned Red Dot Award: Product Design 2014. This is the model’s second award, following on from the iF design award received in February. The Red Dot Awards, organized by Germany's Design Zentrum Nordrhein Westfalen, are widely recognized as one of the most prestigious design awards in the world. Every year, products with designs of outstanding quality are selected in three categories: Product Design, Communication Design, and Design Concept. In FY 2014, applications were received for a total of 4,815 products from approximately 1,800 companies or designers from 53 countries. 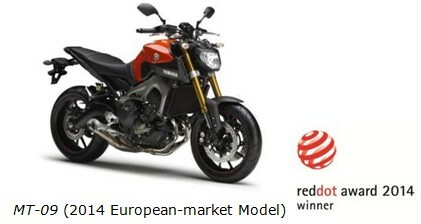 Among these, our MT-09 received a prize in the 'Product Design' category. Sold primarily in Europe since September 2013, the MT-09 features a newly-designed engine developed along the lines of the Crossplane Concept, designed to deliver linear torque in response to rider throttle input. Synched to the rider’s intentions, this model offers sharp handling at will across everyday speed ranges. The mass forward design fuses elements of the naked and supermotard concepts, evoking a sense of agile freedom and the essence of unrestricted movement in every direction. The MT-09 will be available in Japan from April 10, 2014.
chief of the Design Development Department of GK Dynamics Incorporated. Our development team is thrilled and very proud that the MT-09 has received one of the world's most prestigious design prizes, the Red Dot Award. We feel that this high rating is a result of the fresh new styling, which compresses a superior riding performance into an extremely compact body. Our aim is to continue to create attractive designs the rider will enjoy.